Scrumphsus Bites: Skyline Chili - Disgustingly Delicious? Rather than post the ubiquitous pictures of turkey, mashed potatoes, stuffing, etc., I wanted to focus on something more local from one of Cincinnati’s finest institutions, Skyline Chili. 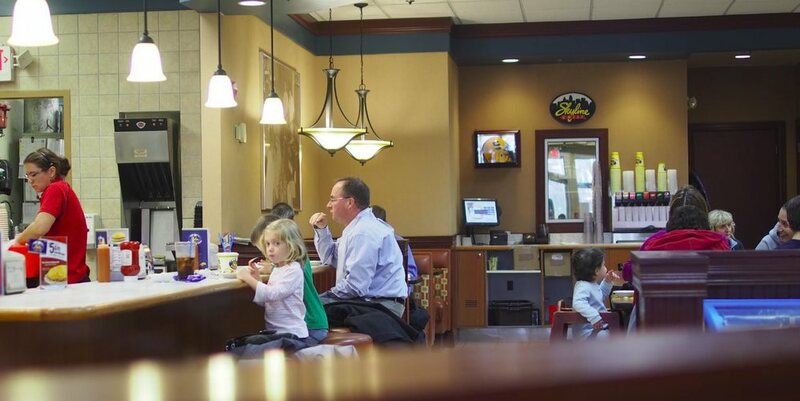 This classic eatery serves a famous Cincinnati-style chili that is both revered and scorned by locals. Polarizing dishes always pique my curiosity, so a visit there was absolutely necessary. The menu describes a few different vehicles to deliver mounds of chili and fluorescent cheese to your gullet. We opted for two cheese coneys (a hot dog topped with Skyline Chili, mustard, onions, and cheese), a plate of chili cheese fries, and their signature dish, a “3-ways” (spaghetti topped with Skyline Chili and cheese). We were here already…no half-measures. This stuff should be banned for kids. Three minutes had elapsed since we placed our order when four ceramic diner plates appeared on our table, the unmistakable aroma of melting cheese and buyer’s remorse overpowering my senses. As I brought up a heaping spoon from the 3-way plate, the fact that I was a Type-2 lactard briefly flashed a red warning flag in my brain. But alas, it was too late. Go big or go home. Should have just went home. I took a big bite and….it wasn’t bad. Thinking that it would taste like savory Texas chili, I was pleasantly surprised at the cinnamon and nutmeg notes as well as the subtle sweet aftertaste. The server told us that the proprietor was Greek and had his own concoction of Greek spices. Another bite conjured up a taste memory of Thelewala’s Chapli Roll. After a minute though, the spaghetti became soggy and the whole dish fell apart. I moved onto the Coneys which were really good. The bun was warm and soft like a Tempurpedic pillow, the mustard had a punch of tart which cut through the sweet chili, and the hot dog itself was not wrinkly dry like Coney Island’s Nathan’s. I devoured it quickly in all its juicy glory. My favorite vehicle out of the three options. The fries deserve honorable mention as they held firm despite the 5 lbs of cheese and chili piled on top of them. Last but not least, the plates of oyster crackers provided welcome relief from the onslaught of cheese…in a way, a palate cleanser with a nice crunch. The spicy Cholula sauce I added in my chili took its toll and required an immediate visit to Graeter’s afterwards. Ramping up production under Walter's watch. If you’re in Cincinnati for the first time, do yourself a solid and check out one of the many locations of Skyline Chili if you’re sober or drunk. Oh, and bring Lactaid and Pepto Bismol.